Following hotel pickup in Flagstaff, you’ll follow State Route 89A, a National Scenic Byway that winds through pine forests and a volcanic mountain range called the San Francisco Peaks. 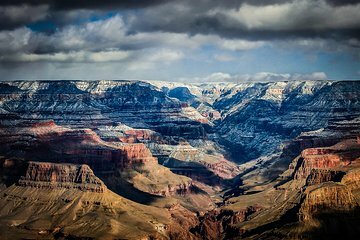 Upon entering Grand Canyon National Park on the western side of the South Rim, you’ll get a glimpse of the vast landscape at Yavapai Point, considered the park’s widest spot from rim to rim. From this overlook, glimpse the Bright Angel Trail and the mighty Colorado River. After lunch at the Maswik Lodge, it’s time to venture to Grand Canyon Village where you have free time to explore after a look at the El Tovar hotel and Hopi House — a pueblo replica. Hike along the canyon rim, visit Kolb Studio, browse for souvenirs, and search the skies for California condors. Continuing along the South Rim, the guide stops at Lipan Point, followed by striking vistas from the Desert View Watchtower designed by architect Mary Colter. If you wish, opt for a scenic helicopter flight over the Grand Canyon, payable direct. Upon leaving the Grand Canyon, the vehicle follows alongside the Little Colorado River Gorge en route to the Cameron Trading Post. Colorful cliffs of the Painted Desert come into view as you enter the vast Navajo Nation. Browse an award-winning selection of arts and crafts before you return to your hotel. This was a really great tour of the Grand Canyon. The guide took us to many spots to enjoy the views and take photographs. Lunch at the cafeteria was included (NOT a box lunch). The guide was very personable and informative, and she pointed out other sites of interest along the way. On the way back we stopped at Sunset Volcano. I had a great time, and saw some really beautiful sights. Recommended!